The Force represented by the Inspector General of Police, Ibrahim Idris, at a public hearing in Senate Committee Room 231, also kicked against move to reduce serving Deputy Inspectors General of Police ( DIGs) from seven to one as proposed in an amendment bill for enactment of the Police Act , 2018 sponsored by Senator Bala Ibn Naâ€™Allah (Kebbi South). 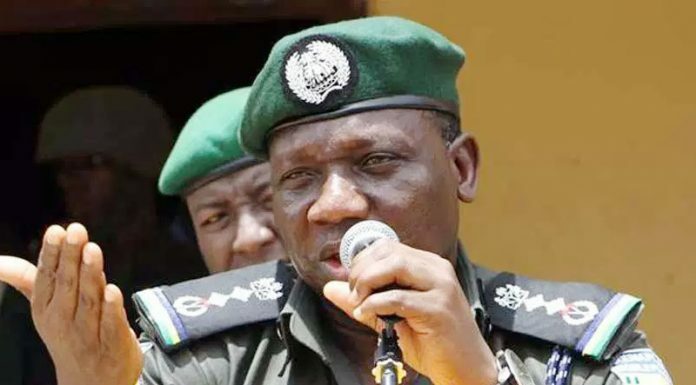 In his submission, the IGP said: â€œ The proposed bill will help in reforming the Police and reposition it in its key role in administration of justice, â€œthere are a few observations by the Police Force. The confirmation and removal of IGP by the Senate should be expunged from the bill. â€œAppointment of the IGP as recommended by the Police Service Commission (PSC) and nominated by the President without Senate confirmation is desirable to Police to avoid politicisation of the whole processâ€. â€œMore men should be in Police environment, barracks for the junior ranks and officers quarters for senior officers. This will make them to behave well and be well disciplined Police,â€ he said. Declaring the public hearing open, Senate President, Dr. Bukola Saraki, represented by the Deputy Senate Leader, Bala Ibn Naâ€™Allah said the Police in the country should be up and doing in securing lives and properties of the citizenry. Saraki said the new law, when enacted, will guarantee better performance of Police and adequate protection of citizensâ€™ fundamental rights and privileges under the law just as he advocated a comprehensive review of funding framework for the police force. Also speaking , the sponsor of the bill, Senator Naâ€™Allah said Nigeria Police, which was in the past regarded as one of the best Police force in the world, has regrettably lost its credibility. â€œ Every attempt to insulate the police as responsible institution has failed. There are so many allegations against the police. Police need to be insulated from politics and politiciansâ€, Naâ€™Allah further said.